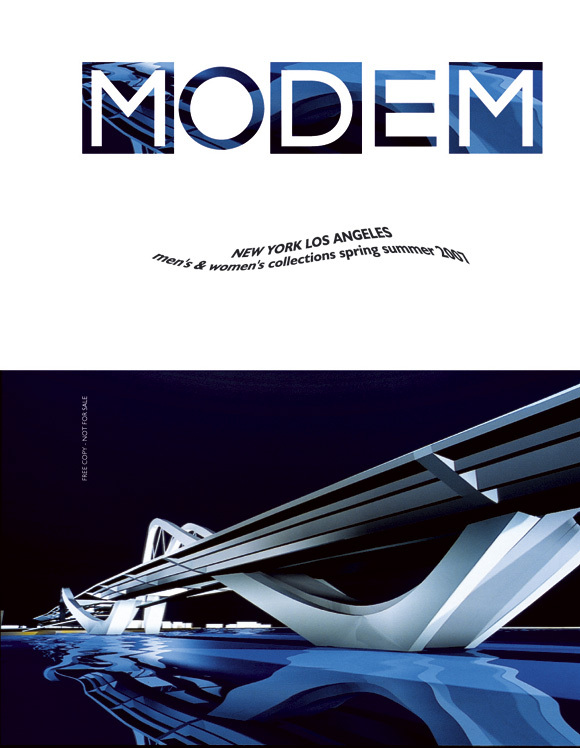 This season, for Modem cover we gave a “carte blanche” to Zaha Hadid, one of the most influencial personality in the world contemporary Architecture & Design. Zaha Hadid is the first woman to have received the prestigious “Pritzker Architecture Prize” from the Hyatt foundation in 2004. Zaha Hadid, with origins from Irak,lives and works in London. Student of Rem Koolhaas and Elia Zenghelis she graduates from the Architectural Association of London in 1977. Originality is one the feature of her work amongst with fluid, transparent, almost abstract shapes which have been some kind of a revolution in the environmental approach and conception of vital space. Her work is now considered a landmark between past present and future and sets a new artistic and architectural vocabulary. Non conventional, yet coherent the philosophy and research of Zaha Hadid have these last 25 years been a role model for a whole new generation of architects. An exhibition of her work is visible in Nyc at the Solomon R. Guggenheim Museum.